The NASA Dawn mission is receiving 40 extra days to explore Vesta and scientists plan to make the most out of it. They hope to learn more about this mysterious asteroid while extending the observations at Dawn’s current low-altitude mapping orbit and building the best possible maps of the elemental composition of Vesta’s surface. PASADENA, California – NASA’s Dawn mission has received official confirmation that 40 extra days have been added to its exploration of the giant asteroid Vesta, the second most massive object in the main asteroid belt. The mission extension allows Dawn to continue its scientific observations at Vesta until Aug. 26, while still arriving at the dwarf planet Ceres at the same originally scheduled target date in February 2015. The extension will not require any new funding, and will draw on financial reserves that have been carefully managed by the Dawn project. The flexibility provided by the spacecraft’s use of efficient ion propulsion system allows it to maintain its originally planned Ceres arrival. The extension allows for extra observations at Dawn’s current low-altitude mapping orbit (average altitude 130 miles or 210 kilometers), which will now last until May 1. The additional time enables the gamma ray and neutron detector to build the best possible maps of the elemental composition of Vesta’s surface and improve data for the gravity experiment, the two primary scientific investigations at the low-altitude orbit. The spacecraft’s camera and spectrometer are also obtaining additional high-resolution images. 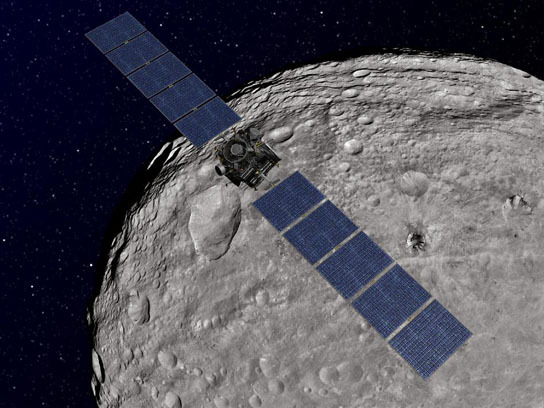 Be the first to comment on "NASA Confirms Extra Time for Dawn to Explore Vesta"